The track and trace service was very good this time. I ordered some items on 10 May, combined shipment with extra items on 12 May and the warehouse shipped all my ordered items out for international shipping on 14 May. 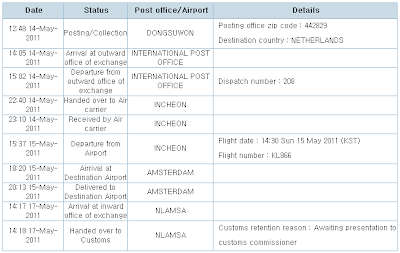 The parcel arrived on 19 May, so it took five days. I am surprised I even got the flight information of the airplane that my parcel was in. Since the track and trace information was so accurate, I knew that I could expect the parcel to arrive today, as it took two days to go through customs last time. Thanks to that, I am able to receive the parcel from the delivery guy myself this time. Now on to what I have bought. 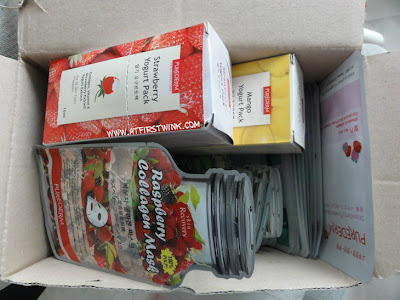 From other bloggers that also won the Gmarket Top bloggers contest, I saw a very good deal for sheet masks. From the seller Purederm, you can get 100 sheet masks of your choice for 26,500 won. You also get a free gift with your purchase: a set of 30 eye masks. After discount, I only paid 23,850 won (about €15). At the discount coupon zone, you can find a 10% off coupon for products in the Cosmetics and perfumes category. This coupon can be applied for purchases over 20,000 won and it also applicable for this sheet mask deal. At first glance, it can be a bit difficult to figure out how to order and to get the discount, so I will explain how over here. The box with my sheet masks. As you might know from my previous Gmarket order post, I ordered a bunch of earrings and I have to find more ways of storing them. 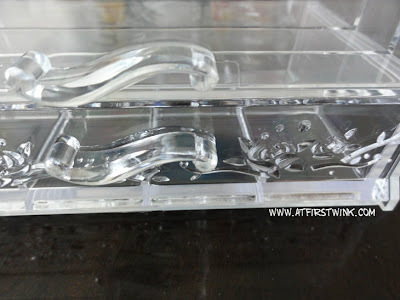 On Gmarket, I found a cute plastic earring container with rose embossing. As a free gift, I received a lipstick case which can store up to 12 lipsticks. You can buy it from the seller, 제일쇼핑. 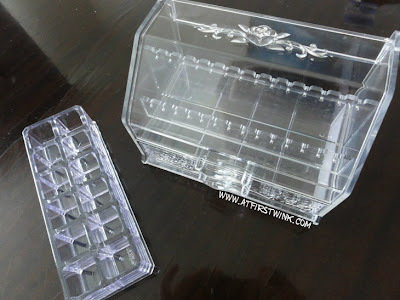 The earring container and the lip stick case. During my last order, a sweater that I really wanted got cancelled, so I tried ordering it again. This time, I was finally able to get it from the seller, 엣지[edge]. 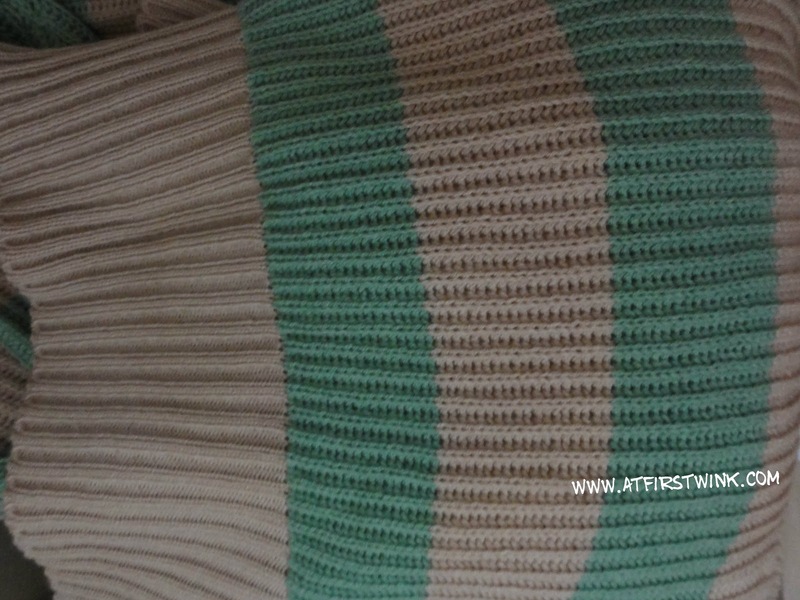 I really like mint green, so I was really excited to get a sweater with this color. But when I took it out of the plastic bag, I was a bit disappointed. 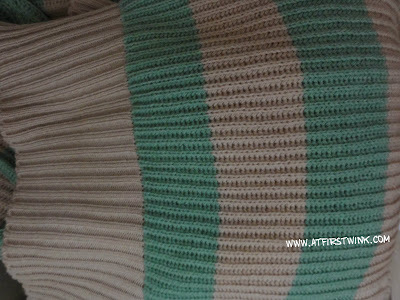 From the pictures on the product page and the first picture I made in daylight, you might think that the sweater has light beige and fresh mint green stripes. 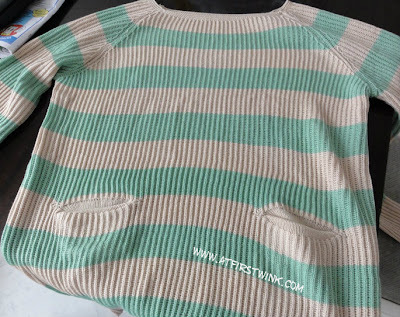 But in reality, the sweater has dark oatmeal brown and normal green stripes, close to the second picture I made. I am surprised how good it looks in photographs and how plain in real life. I might just wear it when I need to get my photographs taken for my passport or only at home, as it looks a bit too grandma-ish to wear it outside on a normal day. But the fabric is very soft and warm. 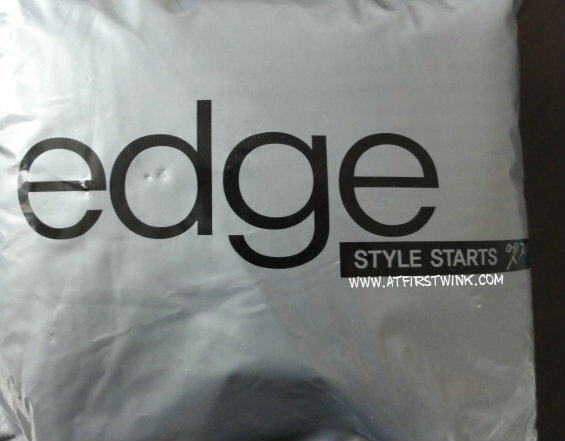 The package of the sweater. How the sweater looks like on camera. Now onto the cosmetics I bought. From the Peripera make up seller 페리페라 본사직영샵, I bought a Wonder Talk Lip Balm and a Kiss Tint. The can of the lip balm is a lot smaller than I thought. I imagined it to be the same size as the Vaseline lip care tins, but it is a lot smaller. 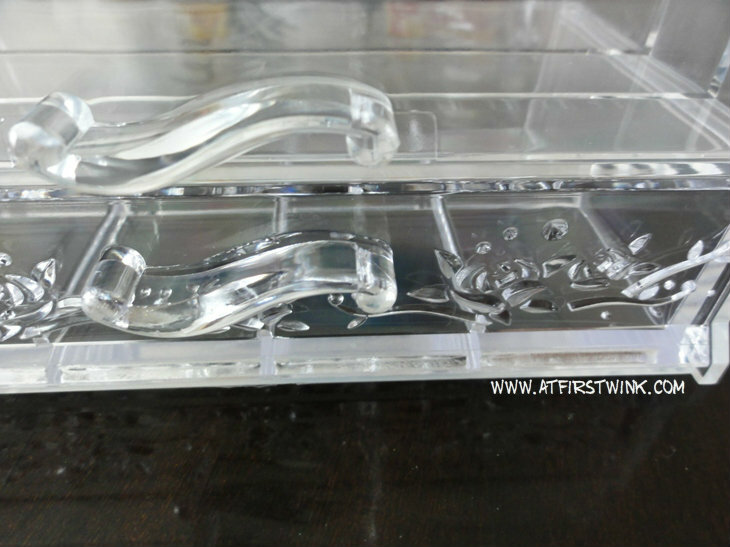 It does however come with a cute, transparent pink applicator. This applicator that looks like a pawn chess piece, can be used to dip in the can and to apply the product on your lips. It is also really convenient that the applicator sticks to the can, as it has a small magnet in the bottom. 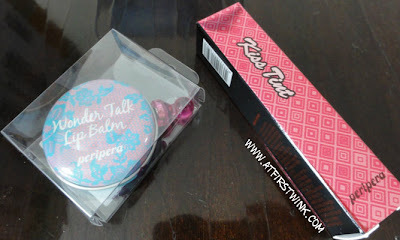 The lace and rose decorations on the tin and the kiss tint are really pretty. Peripera Wonder Talk Lip Balm and Kiss Tint. Taken out of the packaging. From Etude House, I have ordered some products again. I got many free samples of Etude House products this time, so I am really pleased. It almost looks as though the GWPs are more than the things that I paid for. I bought the AC Clinic Pink Powder Spot, which comes in a small green box with a small tube of AC Clinic Acne Foam Cleanser and some q-tips. I sometimes get a pimple on my face and it is good that I can now soothe it by applying a little of this product on it with a q-tip. I also bought the Missing U hand cream in a cute seal container with green tea scent, the Fresh Cherry tint in pink, a lip concealer, and a nail polish in a grey color with a slight lavender tone. The gifts I got for free with this purchase were the Mini size U travel set in the yellow package and three pink miniature tubes of the sleeping pack. My Etude House order and the GWP's. 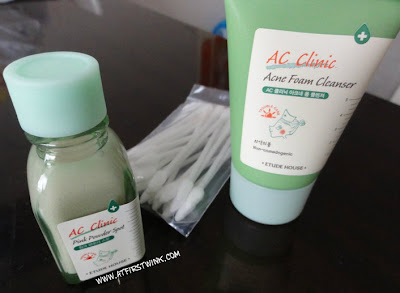 The AC Clinic Pink Powder Spot set. Lastly, I bought some things of the brand Tony Moly from this seller, 토니모리본사직영점. I bought two kind of hand creams (large tangerine and peach). The Peach hand cream, the smaller peach container with lip balm, and the small lip tint in a red nail polish like container were bought as a set for a reduced price. I also bought the Moist Lip Care Stick in Sweet Vanilla. To get the freebies, I had to top the order with a green nail polish for 2000 won. I really like this color and if it looks as good on my nails, I am considering to buy the other colors of this nail polish line too. The freebies were two samples of the famous Tomatox, whitening massage pack, two samples of the Latte Art Cappuccino Cream-in Scrub, and one Floria White Sheet Mask.